The UN chief Ban Ki-moon and the US secretary of state John Kerry are heading to Cairo to try to end two weeks of Israel-Hamas fighting in Gaza which has killed at least 500 Palestinians and 20 Israelis and displaced tens of thousands of people. 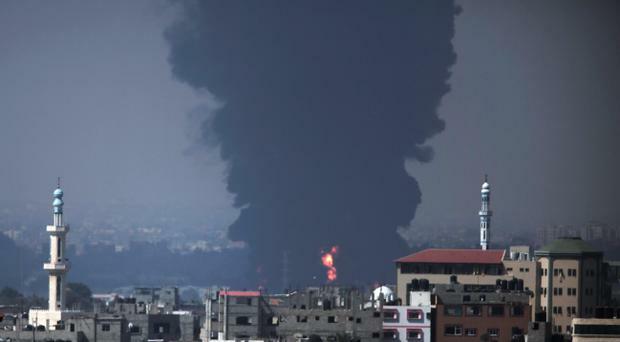 The new ceasefire efforts by the duo followed the deadliest day of fighting since the escalation erupted on July 8, including a reported Israeli shelling of a hospital in the central Gaza Strip. A Palestinian health official said 12 Israeli tank shells hit the Al Aqsa hospital in the town of Deir el-Balah, killing four people and wounding 60. Ashraf al-Kidra said the shells landed in the administration building, the intensive care unit and the surgery department, adding that 30 of the wounded were medical staff. Live footage on Hamas's Al Aqsa TV station showed the wounded being moved on trolleys into the emergency department. The Israeli military says it is checking the report. In New York, the UN Security Council expressed "serious concern" about Gaza's rising civilian death toll and demanded an immediate end to the fighting. As Israeli air strikes continued to pound Gaza, rescue workers near the southern city of Khan Younis were digging out bodies from the one-storey home of the Abu Jamea family, flattened in one of the strikes overnight, said Mr al-Kidra. He said the Palestinian death toll from the two-week offensive had passed 500. More than half of those - 268 - had been killed since the Israeli ground operation in Gaza began late on Thursday. That total includes 20 bodies found at the site near Khan Younis, where two people were pulled alive from the rubble, Mr al-Kidra said. Elsewhere in Gaza, he said, Israeli tanks opened fire on the home of the Siyam family west of Rafah, in the southern part of the strip, killing 10 people, including four young children and a nine-month-old baby girl. "Without any warning at all they began bombarding us at midnight, at 2am," said Mahmoud Siyam, the head of the family. "We are not related to any military or political activities. We are civilised people (living) in this area of Gaza, what crime have we committed?" Meanwhile, the Israeli military said it had foiled a Hamas infiltration attempt through two tunnels leading from northern Gaza into southern Israel. The military said 10 infiltrators were killed after being detected and targeted by Israeli aircraft. Yesterday, the first major ground battle in two weeks of Israel-Hamas fighting exacted a steep price, killing 65 Palestinians and 13 Israeli soldiers and forcing thousands of terrified Palestinian civilians to flee the devastated Shijaiyah neighbourhood, which Israel says is a major source for rocket fire against its civilians. Large sections of Shijaiyah were pulverised by a barrage of Israeli tank and artillery bombardments and repeated air strikes that buffeted the densely populated neighbourhood for most of yesterday. Appearing with Mr Netanyahu, defence minister Moshe Yaalon said Israel expected to complete its work neutralising the Hamas tunnels leading into Israeli territory within several days. Still, much work remains if diplomats are to succeed in brokering a sustainable ceasefire. Mr Kerry yesterday said the US still supported the Egyptian proposal for a halt to the hostilities that Israel accepted and Hamas rejected last week. Hamas remains suspicious of the motives of the Egyptian government, which has banned the Muslim Brotherhood, a group Hamas closely identifies with. The 13 Israeli soldiers who died in Shijaiyah brought the overall Israeli death toll to 20, including two civilians who died from rocket and mortar fire directed at Israeli towns and villages from parts of Gaza. Hamas spokesman Mushir al-Masri last night claimed his group had captured an Israeli soldier. An announcement on Gaza TV of the soldier's capture set off celebration in the streets of West Bank. But there was no official confirmation of the claim in Israel. The Israeli ambassador to the UN, Ron Prosor, said the Hamas claim was untrue. President Barack Obama is expressing serious concern about the rising number of casualties in the Gaza Strip. Mr Obama called for an immediate ceasefire. He's asking Secretary of State John Kerry to do whatever he can to help negotiate one at talks in Egypt. Israel's fight against Hamas has killed at least 530 Palestinians and 20 Israelis and displaced tens of thousands of people from Gaza in the past two weeks. The president says Israel has already done significant damage to Hamas. But he says he doesn't want to see more civilians getting killed.